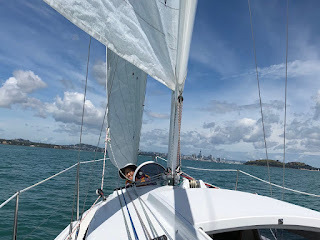 Room 5 @Sunnyhills: My Amazing Adventures to Waiheke Island on our Yacht! My Amazing Adventures to Waiheke Island on our Yacht! On the 31st of December 2017 and the 1st of January 2018 my family and I went to Waiheke Island on our yacht, we got to row our small boat to the beach, and had a chance to look around. This is a picture of my holiday. You are so lucky to have a family yacht! Waiheke is a beautiful place to sail to. Do you ever go fishing off your yacht Karol? Yes, some snappers. Karol is a little fishery officer, but she can't judge without her measuring tape. Poor litter fish, lol. This sounds like a magical holiday on your yacht Karol! So lucky!